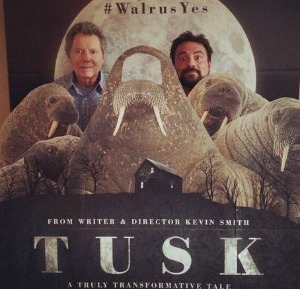 The upcoming indie film Tusk has partnered with a dispensary called Buds & Roses and a company called Kushman Veganics on two strains of medical marijuana — White Walrus and Mr. Tusk — that will also be a promotional vehicle for the film. The movie is about a man who’s slowly turning into a walrus, stars Justin Long and is written and directed by Kevin Smith, who’s known for taking a liking to the wacky tabacky from his previous work, such as Clerks. “This is right at the intersection of art and stoner culture,” Graham Retzik, a marketing strategist with the film company A24 told The New York Times. Indeed. We’ve reached the point where few people are still making a really big deal out of marijuana, but it still hangs on to a bit of the old taboo. So, as the article says, there is some risk to the tie-in. But more than anything, the film is really jumping in front of the mainstreaming of marijuana in this country. Just as people are getting used to pot being legalized all over the place, here’s this movie that’s taking it a step further to incorporate it into the day-to-day business of pop culture. The marijuana, which the article says is high-quality enough to be considered for an award, could be available in Colorado. This isn’t the right move for a lot of companies, but for this film, which definitely has a little Kafka overtone, it could totally make sense. Or it could be necessary depending on how graphic the transformation is. It had its debut at the Toronto Film Festival and opens in theaters September 19.